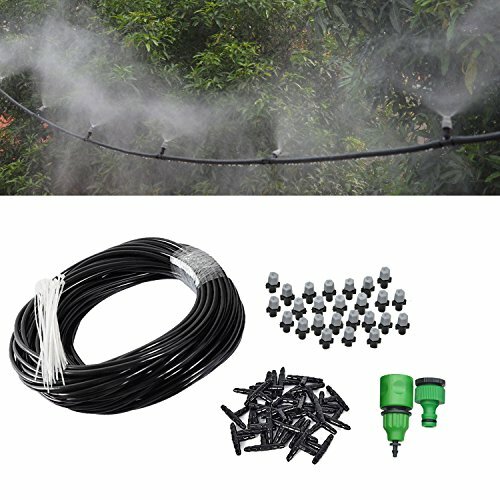 For 50Ft outdoor misting cooling system with 20 plastic mist nozzle sprinklers. Connect with 1/2" 3/4" male thread water faucet. Ideal for agriculture, lawn, garden, patio, greenhouse, swimming pool misting fog cooling irrigation. 1,Please cut the black tube into several parts according to your requirements. 2,Please insert the mist nozzle into the connected part of the tube. 3,Insert the nozzle into the tube. 4,Using the cable tie to fix the tube. Some tips for intallation: If the faucet leak happens, it might because of the surface of your faucet is smooth. Wrap pipe seal tape around the mouth of faucet before install connector. Those T Joints might have a little difficult to install, but don't worry, put 3mm(can not too long, too long will easy to recedes, then falls off.) long tube into the 60-80 degrees hot water within 5 seconds, then it will easy to put the tube into the T Joints. Fine Mist Particles: ≤70 microns (fine mist instead of smoke-like). Flow rate: 6.7-7 L/Hour. This kit has everything you need to get started. Saves up to 70% more water over traditional spray & drip heads, making your system great for saving water in drought conditions. Please contact us to get support when you have no idea how to install this system kit, and we provide 30 Days free return/replacement,no need to worry about your money. Buy it right now, make your garden amazing. View More In Misting Systems. If you have any questions about this product by Forfuture-go, contact us by completing and submitting the form below. If you are looking for a specif part number, please include it with your message.